Welcome to Day 3 of the 30 Days of Christmas! 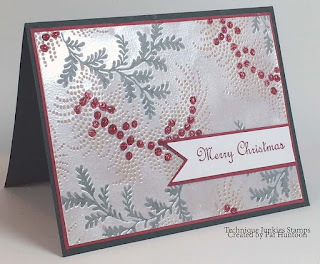 Today I have a card that uses two of the new Christmas Stamps this year, Winter Foliage and Merry Christmas 2. To create this card, I stamped the Winter Foliage stamp on White Vellum, and heat embossed it with a pearlized white embossing powder. Then, working on the back side of the vellum (the non-embossed side), I colored the foliage, branches and berries using markers. The finished piece was matted on the card stock, and the sentiment was added to the front. I hope you have enjoyed today's card! Remember that all of the Technique Junkies Christmas Stamps are 20% off through October 31st; simply use the word Christmas at checkout.